Economical windscreen replacement of your Seat Leon? The Seat Leon is one of the most popular models of the Spanish car brand Seat. This car has been available since 1998 and nowadays is the fourth generation on the market. If you have a Seat Leon in your possession and want to replace the windscreen, it can be difficult to find the best address to do this. Fortunately, the windscreen replacement of the Seat Leon can be done easily and quickly. Thanks to the use of after market car windows, the price of a new windscreen is considerably lower than that of a brand dealer. We'll tell you more about this after we go into the history of Seat Leon and the successful Seat Leon. Seat originated in 1950 in Spain. After the civil war and the Second World War, a consortium of banks, together with the Spanish government, decided to set up a car brand. This is mainly in order to stimulate the car industry in the country and to boost the economy. At that time, Spain was lagging far behind most other countries in Western Europe. The aim was to create a car brand made entirely in Spain, by Spaniards and with Spanish parts. The founders knew that this would be very difficult without outside help and they found in Fiat a suitable partner to help them on their way. which was introduced in 1957, was a particular turning point. This small car was affordable and for many Spanish families a first car. Seat certainly contributed to the construction of the economy in Spain in those years. When Seat wanted to expand in the early 80s, it found no response from Fiat. The contract was therefore terminated and the German Volkswagen group saw its chance clean. The cars made by Seat since that time are often linked to other models within the Volkswagen Group. Seat has been fully owned by Volkswagen since 1990 and the brand has grown under these wings into a renowned car brand. 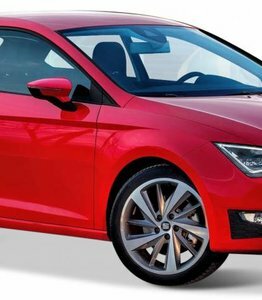 The success of the Seat Ibiza enabled Volkswagen to identify the best strategy for scoring with Seat models without interfering with the other brands within the group. By opting for a more sporty design and also by making things like the suspension stiffer, it became a car for the often somewhat younger car owners. It was not without reason that versions with more powerful engines soon followed. The most powerful version of this Seat Leon of the first generation had more than 200 hp. This made the car a lot more sporty than the affiliated Volkswagen Golf and Bora. Moreover, this model was just a little cheaper and slightly less luxurious than the Audi TT and Audi A3, which also looked very similar. All this while the Seat Leon has room for five people, a reasonably spacious boot and even as an option the luxury of a windscreen with rain sensor. The city of León is known for its beautiful cathedral and is also the capital of the autonomous region of Castile and León. Due to the excellent sales figures it was decided to make a second generation of the Seat Leon. It first appeared in 2005. In terms of design it doesn't differ very much from the first generation, but the lines are a bit tighter and sharper. Especially from the inside is the car updated to the new standard of that time where optionally even the windscreen of the Seat Leon was replaced with windscreen heating. The sporty touch has also been applied and in the end there was an even more powerful version of Seat Leon available. The most expensive version of this generation has almost 300 hp and is therefore one of the most powerful cars that Seat has produced so far. The newest generation of the Seat Leon appeared a few years ago. The car is again adapted from the inside and from the outside. Especially the extra space inside, while the car has become less long, is a big advantage. In addition, many new safety measures have been built into the third generation of the Seat Leon and modern features such as driver fatigue detection and lane-keeping assistant are available as options. With the latter option, the windscreen is equipped with a camera. This latest model shares a lot with the Audi A3 Mk3, the Volkswagen Golf Mk7 and the Skoda Octavia Mk3. When is it necessary to replace the Seat Leon windscreen? The car window replacement is fortunately not required immediately when glass damage has occurred. As long as it's an asterisk, for example, you can continue driving or have it repaired. Even a crack is not necessarily a sign that you need to replace the windscreen of the Seat Leon quickly. A small single crack that is not in the direct view of the driver is not a direct reason to replace the car window. But it does so when it is a multiple crack or one that is in the direct view of the driver. The Seat Leon windscreen replacement is then quickly needed because the crack can reflect primary sunlight and light from oncoming vehicles into the eyes of the driver of the car. This can cause glare and is obviously dangerous when driving a car. Secondly, the windscreens are to a large extent important for the stiffness of the car. In the event of an accident, this ensures that the impact can be absorbed as effectively as possible. A crack can affect the car's stiffness and therefore no longer offer optimum protection in the event of an accident. Replacing your Seat Leon windscreen is therefore not a job that you can postpone when this type of damage has occurred. Do you want to do the windscreen replacement of your Seat Leon yourself? That is also possible! It is possible to do the windscreen replacement of the Seat Leon yourself by ordering a separate car window without assembly. Although many other suppliers of automotive glass do not give this option, you can find it here. Car window replacement at low cost can also be significantly cheaper than through a brand dealer. This is because the brand dealers have the exclusive right to sell car windows with a brand logo. Due to this unique position, they demand higher amounts than is necessary. The only difference between the automotive glass that brand dealers sell and after market car windows is the absence of the brand logo. If you don't want to replace the windscreen of the Seat Leon yourself, you can also count on us. Our certified partners will be happy to replace the Seat Leon windscreen on site. This way, too, you can be sure that you are considerably more advantageous than through a brand dealer. Do you want to get back on the road quickly and safely? Order today the replacement for your Seat Leon windscreen.